Marc h is a beautiful month as everything comes to life and the one just enjoyed was no exception. We can enjoy the warm sun again, the flowers, the birds singing and the green around us makes us feel hopeful for the future. In this past month, because there is so much need, we cared for 89 elderly residents. 41 at JFL I & II and another 48 in ECO which is at full capacity. The need is still there and each week we receive more requests from families that need support in caring for their elderly love ones. We are praying to God to help us in knowing how to care and love them the way they need and to feel the presence of God in your lives and we are looking forward for opening the Tileagd Assisted Living Centre where we will be able to care for even more needs. Audrey Hepburn said that “The beauty of a woman is not in a facial mole, but true beauty in a woman is reflected in her soul. It is the caring that she lovingly gives, the passion that she knows.” This is why on March 8th we celebrate in the both centres the Ladies day. We celebrate our ladies and acknowledge the importance that they played in our lives and learn from their wisdom. 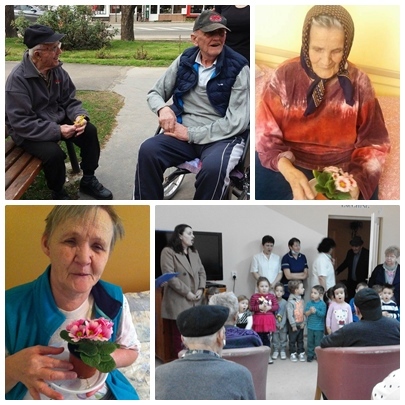 T o make this day special in Oradea we had the children from the Association of Adopted Children present a program for our resident ladies and give them flowers as a token of our respect and appreciation. 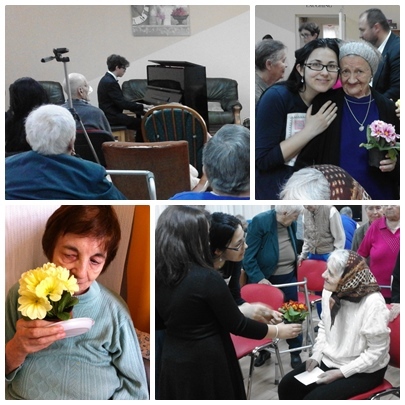 In the afternoon we held a piano concert and Lavinia, the pianist, made it more special by asking the elderly from the centre to recite poems about mothers. Even if they don’t have mothers around them any more they remember them and give us advice about how not to take our mothers from granted, to love and appreciate them every day, before it’s too late. It was a memorable moment as we all remembered our mothers and the many sacrifices they made for us. March 8th was a special day in Salonta too. We gave every lady a flower showing our appreciation and in this way we bring so many smiles to their faces. Something that was very interesting happened in the dementia wing. Because they are not aware any more of the days, receiving a flower was so mething unexpected and brought so much joy in their hearts, and they felt the moment so much different than the others. 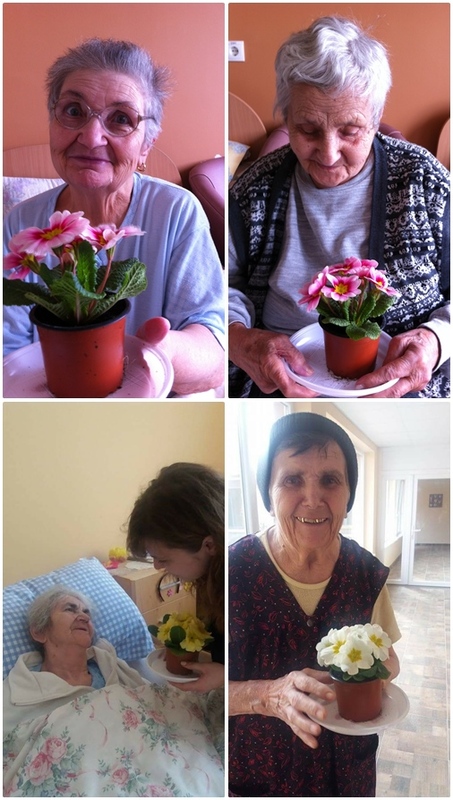 Their whole day was changed…and we were amazed at how a simple flower can have such an impact on someone’s life. Hours later, when they were looking to the flowers not remembering what day it is, they were still smiling, because the inner feelings last longer than their memories. 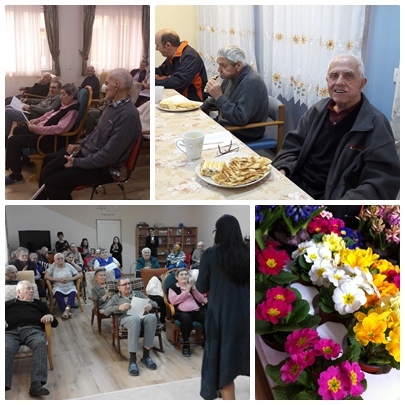 March 17th was a very special day for ‘Doris’ Centre in Salonta, when we remembered and celebrated the birthday of Doris Hoy. She would have been 99 years old and although she is not with us anymore, her memory is cherished in our centre. She was a caring, loving, kind, generous woman and we all have that to learn from her life. In her memory, we had cakes and the residents became emotional when we told them what we celebrate. They are very thankful for her and everything she did for Romania, but especially for teaching Kevin the importance of caring for those in need . I was an honour to know her and it is a privilege to have the centre that I manage named after her. Thank you ‘Lady Doris’ for the example you give us when you were around us. Mandy Hale said “There is nothing more beautiful than someone who goes out of their way to make life beautiful for others.” So my advice is COME and make life beautiful for our elderly. 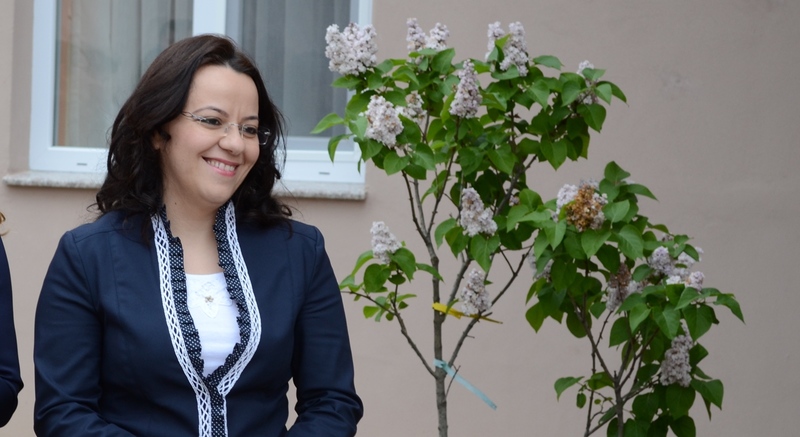 Many thanks to all of you that have already decided to make life beautiful for the people of Romania month after month through your support. Please continue to pray for us to be able to bless the lives of the elderly that need our help. •For financial support to deal with all the challenges that have come with the new salary increase.